Precision Martial Arts Academy’s (PMAA’s) Instructors and Leadership Team are personally taught and mentored by Master Derek Sadler, ChPC, PFT, 7th Dan Black Belt in PMAA’s extensive GOLD (Guidance on Leadership Development) Instructor Training Program. Regular attendance at monthly Instructor Training Sessions are on going with Master Sadler due to the dynamic curriculum and programs offered, as well as the high standards that PMAA demands from its students. Furthermore, PMAA’s Instructor Team are expected to attend Professional Development (PD) courses, workshops and seminars throughout the year. 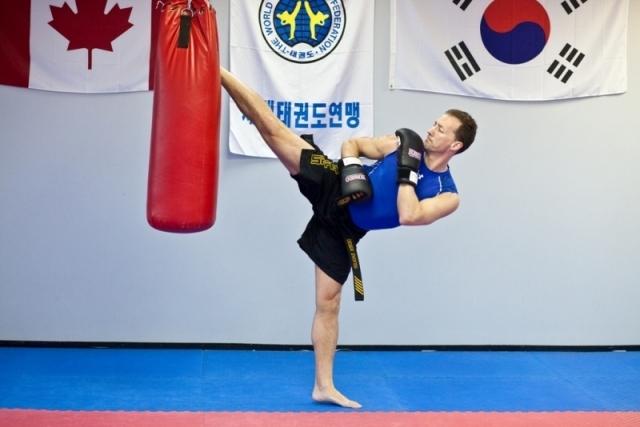 All Junior and Senior Head Instructors are Certified by the National Coaching Certification Program (NCCP) as well as Taekwondo Canada’s Assistant Instructor (A-I) and/or Dojang Coach (DC) contexts. First Aid, CPR & AED training, and/or baby-sitting certifications are also a mandatory requirement each year to ensure student safety at PMAA. Master Sadler competing on Team Canada in Tunja, Columbia at the 7th World Poomsae Championships in December 2012.